Maths Activities Kit Manual Book, Maths Activities kit ebook, Maths Activities kit Digital Book, NCERT Secondary Mathematics' Manual Book for Maths Activities performing: One of the most significant recommendations of the National Curriculum Framework (NCF)-2005 is the mathematisation of the child’s thought processes. In achieving this goal, concrete mathematical experiences play a major role. A child is motivated to learn mathematics by getting involved in handling various concrete manipulatives in various activities. In addition to activities, games in mathematics also help the child’s involvement in learning by strategizing and reasoning. 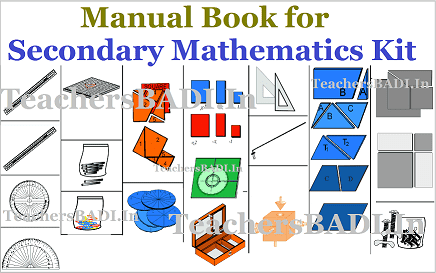 For learning mathematical concepts through the above- mentioned approach, a child-centred Mathematics kit has been developed for the students of Secondary stage based on some of the concepts from the newly developed NCERT mathematics textbooks. The Maths Activities Kit kit includes various kit items along with a manual for performing activities.The kit broadly covers the activities in the areas of geometry, algebra, trigonometry and mensuration. Here are some of the special features of the kit items : Two variety of plastic strips with slots and markings have been provided. They help in creating angles, triangles, quadrilaterals and determination of values of trigonometric ratios. The full or half protractor can be fixed on the strips for measuring the angles in the activities related to angles, triangles, and quadrilaterals. Circular Board: A Circular Board is designed in such a manner that it can be used to verify results related to a circle as well as trigonometric ratios. Geoboard: A Geoboard is a board of dimensions 19cm 19cm 1cm having holes drilled on side A of it at a distance of 1cm each. Geoboard pins can be fitted in the holes and with the help of rubber bands different geometrical shapes can be formed. Cut - outs of corrugated sheet: Cut - outs of corrugated sheets in the form of parrrllelogram, triangle, trapezium and circle help in learning concepts related to areas. cube: A cube with adjusting cut-outs of cuboid, cylinder, cone and hemisphere have been given to construct the concept of surface area and volume. Cut-outs of plastic cardboard: Cut-outs of plastic cardboard in the form of triangles, quadrilaterals and rectangle etc. have been given to verify Pythagorus theorem and algebraic identities like a 2  b2  a  b   a  b  . Algebraic Tiles: Another interesting item, Algebraic Tiles has also been provided. They are provided in two different colours and three different sizes. They can be used for concretisation of the concept of factorisation of quadratic equations. The kit items, apart from being academically useful, are also designed in attractive manner. It is hoped that this kit will generate enough interest for learning mathematics at secondary stage. It will prove to be an important part of the mathematics resource room in the schools across the country. ACTIVITY 1 : To form different angles and measure 1 them. ACTIVITY 2 : To verify the relation of different pairs 5 of angles formed by a transversal with two parallel lines. ACTIVITY 5 : To verify that a lin e drawn through 17 the mid-point of one side and parallel to the second side bisects the third side. ACTIVITY 6 : To verify the basic proportionality 19 theorem. ACTIVITY 7 : To verify that a line dividing two sides 21 of a triangle in the same ratio is parallel to the third side. ACTIVITY 8 : T o ex plo re var ious pr ope rti es of 23 different types of quadrilaterals. of a quadrilateral taken in order, is a parallelogram. ACTIVITY 10 : T o f o r m d i f f e r e n t s h a p e s o n a 31 geoboard and explore their areas. of squares of their corresponding sides. (a) lying on the same base. (b) lying between the same paralles but not on the same base. ACTIVITY 14 : To verify that triangles on the same 42 base and between the same parallels are equal in area. ACTIVITY 16 : To verify that for a triangle and a 46 parallelogram on the same base and between the same parallels, the area of triangle is half the area of parallelogram. ACTIVITY 17 : To explore area of triangle , 48 parallelogram and trapezium. ACTIVITY 24 : To verify that equal chords subtend 70 equal angles at the centre of a circle. ACTIVITY 25 : To verify that chords subtending equal 72 angles at the centre of a circle are equal. is perpendicular to the chord. ACTIVITY 28 : To verify that equal chords of a circle 78 are equidistant from the centre of the circle. ACTIVITY 29 : To verify that the chords equidistant 81 from the centre of a circle are equal in lengths. ACTIVITY 30 : To verify that equal arcs of a circle 83 subtend equal angles at the centre. ACTIVITY 31 : To verify that the angle subtended by 85 an arc of a circle at the centre, is double the angle subtended by it on any point in the remaining part of the circle. ACTIVITY 32 : To verify that the angles in the same 88 segment of a circle are equal. ACTIVITY 33 : To verify that an angle in a semi circle 90 is a right angle. ACTIVITY 36 : To verify that the tangent at any point of circle is perpendicular to the radius through the point of contact. ACTIVITY 37 : To verify that the lengths of the two tangents drawn from an external point to a circle are equal. ACTIVITY 38 : To understand the meaning of different trigonometric ratios using the circular board. ACTIVITY 40 : To verify that the values of trigonometric ratios of an angle do not vary with the lengths of the sides of the triangle. ACTIVITY 41 : T o verify standard trigonometric identities. Activity 42 : (i) T o understand the concept of surface area and volume of solids. ( i i ) To verify the fact that increase\decrease in the volume of a solid may not result the same change in its surface area.